Taunton, England (AP) — South Africa kept their nerve at the death to beat England by three runs in the second Twenty20 on Friday and take the series to a decider. Andile Phehlukwayo bowled a dot ball last delivery of the game, with England needing four to win, to see South Africa squeeze home in a thriller. Liam Dawson hit a four the ball before, but couldn’t repeat as South Africa struck back in the three-game series. South Africa made 174-8 batting first, a total that appeared to be mediocre at best when Jason Roy (67 off 45 balls) and Jonny Bairstow (47 off 37) were hitting boundaries all around the park in a 110-run partnership off 70 balls. England ultimately lost five wickets for 46 at the end as Jos Buttler was bowled by a Phehlukwayo yorker, captain Eoin Morgan was out a ball after striking a blistering four down the ground to give England hope, and debutant Liam Livingstone ran himself out in the penultimate over. 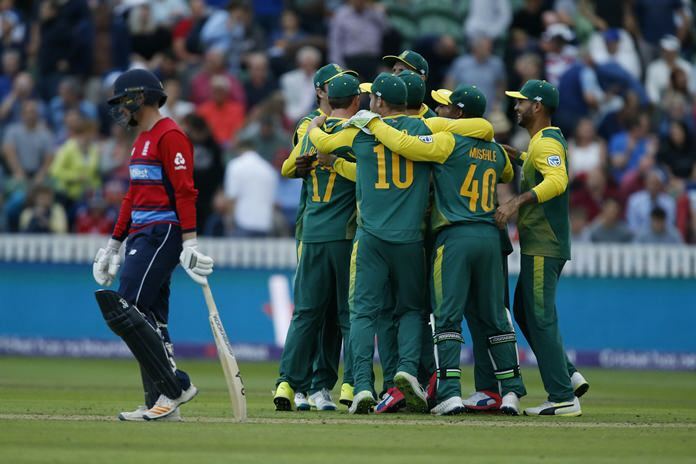 South Africa captain AB de Villiers top-scored for his team with 46 and opener JJ Smuts made 45, but there was little else for the Proteas who appeared around 20 runs short of a competitive score at the County Ground, with its short boundaries. Another England debutant, quick bowler Tom Curran, took 3-33, including a wicket with his second ball when he bowled Reeza Hendricks. The deciding game is in Cardiff on Sunday, when the teams are playing for this T20 series but also a solid psychological advantage ahead of the test series starting next month.